It’s Valentine’s week so here is a sweet romance for you! I loved this book! It’s a must have. Adorable, sweet, fun and lovely. How many more positive adjectives can I give you? 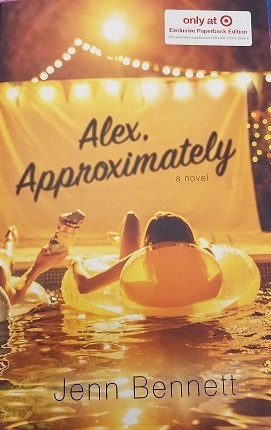 Alex, Approximately is a wonderful, summery read. It’s exactly what I look for in a fun beach read (although I will admit reading it in the depths of winter snow storms kind of made me want to move to California just so I could enjoy some of the summery weather showcased in the book). Bailey has just moved from Washington DC to a small town in California. She has entire summer ahead of her before she starts her new school. She also has a pen pal (or the modern version of one – an internet discussion board friend) who she has a huge crush on but is nervous to tell that she’s moved to his hometown. So instead of telling him, she decides to try and figure out who he is using clues from his messages. Along with her search, we get to follow along as she starts a summer job at a ridiculous tourist attraction, meets a whole host of potential friends, and hangs out with her not-so-newly divorced dad who she hasn’t seen in about a year. While we know exactly who Alex really is (thanks to the back cover copy), Bailey (and Alex) take a while to figure it out. And we get to watch the shenanigans and the emotional tug-of-war as they try to figure out their love lives. The enemies to lovers is one of my favourite tropes when it’s done well (which usually means enemies due to a ton of misunderstandings and silly mistakes). All in all, it’s really funny and heartwarming. I must point out one of my favourite parts of this book – the positive depiction of family relationships (that is sometimes missing in contemporary YA books). Bailey’s relationship with her dad and Porter’s relationship with his family were really neat to see and demonstrated some great communication. If you’re looking for a sweet, fun read with few surprises – you’ll likely enjoy Alex, Approximately.